Built by Lockheed Aircraft Corporation (LAC) in Burbank, California. Converted from a E model into a F-4 photographic reconnaissance version. Delivered to the U. S. Army. Disassembled and shipped overseas to Australia and reassembled. Assigned to the 5th Air Force, 6th Photographic Reconnaissance Group, 8th Photographic Reconnaissance Squadron. Nicknamed "Dotin' Donna". Tail and nose number "77". When lost, engines V1710-27-29 serial numbers (left) 41-33773 (right) 41-33151. No weapons installed. Officially condemned on October 31, 1944. On May 21, 1943 took off from 14 Mile Drome (Schwimmer) near Port Moresby piloted by 2nd Lt. Robert M. Blackard at approximately 9:00am on mission 140Z, a solo reconnaissance flight from 23,000' over Wau, Salamaua and the Markham Valley. Weather was clear with few scattered clouds and good visibility. Last seen on take off. 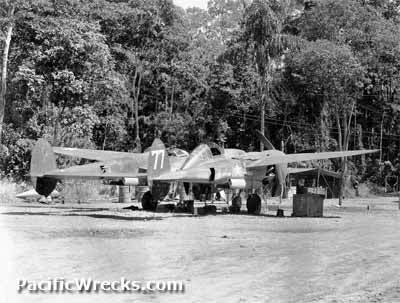 When this Lightning failed to return it was listed as Missing In Action (MIA). On May 22, 1943 Lightnings from the 8th Photographic Reconnaissance Squadron twice searched unsuccessfully over the Salamaua to Markham area, that resulted in nil sighting. On May 23, another search was made without results over Salamaua. Other searches were conducted on the 25, 26, 27, 28, 29, 30 all without results. Captain Frank S. Savage, C.O. 5th Bomber Command Operations, Fighter Section alerted Allied aircraft in the area to lookout for this missing plane. Also, Australian Army patrols searched without results. On September 16, 1944 natives located the wreckage of this aircraft in the vicinity of Nassau Bay in the Markham Valley. The number "2117" was observed on the wreckage. Remains, presumed to be the pilot were found in the aircraft with a Colt .45 caliber pistol serial number 840898 issued to Blackard prior to his departure from the United States. Blackard was officially declared dead the day of the mission. Postwar, his remains were transported to the United States for permanent burial at Sunset Lawn Cemetery in Harrisburg, IL.